The 2009 hyundai accent electric vehicle qualifies for a federal tax credit of up to $7,500, effectively reducing the net base price. 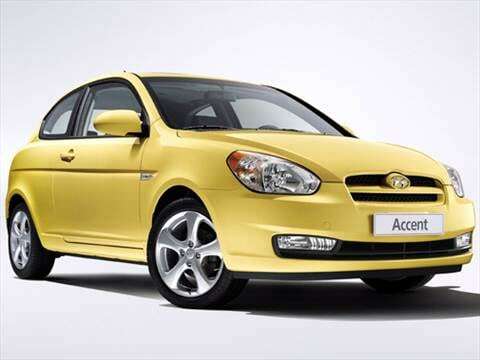 Introduced in 1994, the Hyundai Accent led U.S. entry-level car sales from 2000-2005, mostly due to its value for the money and an aggressive warranty. Now that fluctuating high fuel prices have this segment heating up, Hyundai's third-generation Accent will have tough new competition for 2009 – Korean partner Kia's Rio, Honda's Fit, Nissan's Versa, Toyota's Yaris and Chevrolet's upgraded Aveo – but it still should continue to be up to the task. If you want something a bit more expressive, especially in a four-door sedan, or prefer a Japanese or domestic brand, you should take a good look at the Honda Fit, Toyota Yaris, Nissan Versa and the surprisingly competitive Chevy Aveo. For 2009, cruise control is added to the Popular Equipment Package, and the SE Premium Package now includes a power sunroof. Those with an eye on pump prices and their wallet will be happy to know that fuel economy estimates are up over those for last year's model. Hyundai's 1.6-liter four-cylinder engine generates 110 horsepower, but it's hardly a strong performer. Driving the optional four-speed automatic in our test GLS sedan, it managed zero-to-60 mph acceleration in a bit over 13 seconds. By today's standards, that's on the slow side. The SE three-door with the manual five-speed transmission can do it in about 11 seconds. Also, like most small engines in inexpensive cars, it's a bit noisy and thrashy at high rpm. Otherwise, our GLS rode and drove fairly well and scooted through turns with surprising response. Despite its eight manual adjustments, the driver's seat did not provide a really comfortable position for us, and its rearward adjustment was insufficient for our longish legs. The cloth-lined trunk is relatively roomy and the rear-seat pass-through is handy, but rear roominess is just par for the class. We were pleasantly surprised with the steering and handling of our Premium Package-equipped test GLS on its available 15-inch tires and alloy wheels, and the sports-oriented SE three-door does even better on its 16-inch tire-and-wheel package. An extra-long warranty is one thing an automaker can offer to improve buyer confidence and Hyundai's is one of the best, with five-year/60,000-mile bumper-to-bumper and 10-year/100,000-mile powertrain coverage that's matched with impressive quality improvements. The Accent's interior materials are consistent with its price: Generally inexpensive but with attractive textures and two-tone trim. Among the least-appealing items is the central swing-open bin that's shaped like an ashtray but isn't; the actual ashtray is an odd removable cup that sits atop the console. The radio is an easy-to-use unit with large knobs for volume and tuning, while the three-dial HVAC controls are attractive and have a quality feel – except for a too-stiff temperature dial. While the SE three-door is sporty and expressive, we think the Accent sedan is pretty plain vanilla. Its design is clean, functional and fairly aerodynamic, but hardly exciting. The best part is probably up front, with large wide-eyed headlamps, a full-width lower air intake and distinctive grilles – a body-color bar across the three-door models, a black-out pattern on the four-door. One nice touch is a body-color protective molding along each side to fend off shopping carts and help prevent door dings. The modest GS standard-equipment list includes power steering, tilt steering column, eight-way manually-adjustable driver's seat, 60/40-split rear seat, cabin air filtration, tachometer, variable intermittent wipers and a rear spoiler. The SE adds air conditioning, power windows, locks and mirrors, 172-watt six-speaker audio system with CD player and XM Satellite Radio, remote keyless entry with alarm and panic alert, fog lights, sport suspension, four-wheel anti-lock disc brakes (ABS), Electronic Brake-force Distribution (EBD) and 16-inch alloy wheels. The GLS Sedan has base GS equipment plus air conditioning, but needs an optional equipment packages to get ABS brakes, auxiliary input jack, 172-watt CD player and the power items. All models boast extensive standard safety equipment, including seat-mounted side airbags and roof-mounted side-curtain airbags, in addition to advanced front airbags. Optional on the SE are a power sunroof, cruise control and ground effects kit. A Popular Equipment Package for the GLS includes ABS, a 172-watt six-speaker CD audio system, auxiliary input jack and tilt steering wheel, while an available Premium Package adds all that plus 15-inch alloy wheels, power windows, locks and mirrors, remote keyless entry and cruise control. A four-speed automatic transmission is available on all three models, and there's a long list of (mostly sports-oriented) port- and dealer-installed accessories. Hyundai's 1.6-liter four has dual overhead camshafts, four valves per cylinder and CVVT (continuously Variable Valve Timing) on the intake side. It generates 110 horsepower and provides a very respectable – and wallet-friendly – 26/35 EPA miles per gallon when teamed with the optional automatic in the GLS sedan. The Manufacturer's Suggested Retail Price (MSRP) for the base 2009 Accent GS hatchback starts around $10,500, while the SE starts closer $16,000. Adding an automatic transmission adds another $800 to the bottom line. The 2009 GLS sedan will sell for around $13,500, about the same price as the comparable Toyota Yaris and a bit less than the Honda Fit. Be sure to check Fair Purchase Prices for what buyers are actually paying in your area. As for resale, we expect the Accent to hold average five-year values, slightly higher than the Kia Rio and Chevrolet Aveo and well below the Honda Fit and Toyota Yaris. 165,000 mostly highway miles. Regular oil changes and checkups have kept it running like new. Perfect around town or first car for new driver! Very economic to own, no mechanical issues ever.